Some of my girl friends are on the gluten-free, dairy free diet and have sworn off eggnog for the season so this cocktail is for them. One of my closest friends was thrilled when she found that out and with a big sip proclaimed,“a little Noel cocktail.” So I am naming it Noel. Add one and a half ounces Woodford Reserve to a Bodum glass. 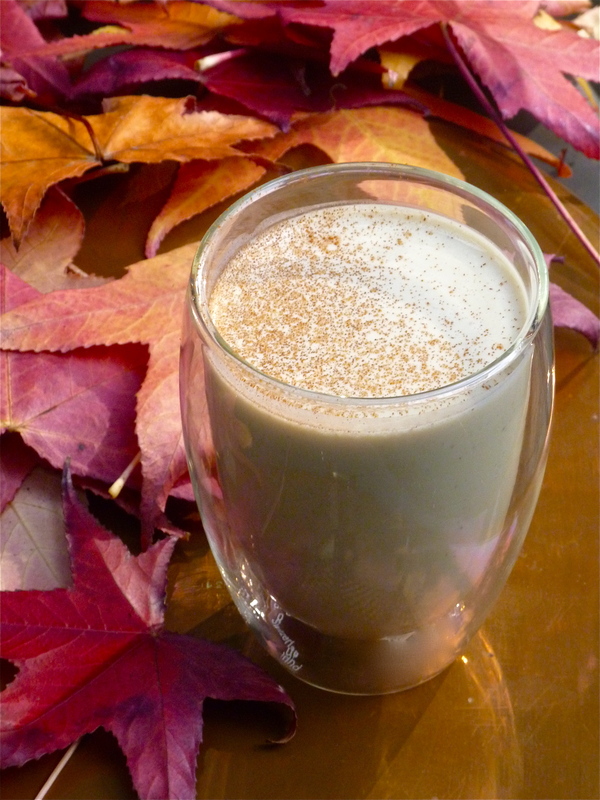 Fill the rest of the glass up with Almond Eggnog. Stir well. Garnish with cinnamon. In a small bowl beat egg yolks and sugar until thickened. Set aside. Heat almond milk with the cinnamon stick in a small saucepan stirring frequently for about ten minutes or until the liquid has reduced by a third. Pour almond milk into egg mixture very slowing while whisking egg mixture so the eggs don’t scramble. Return mixture to the saucepan, stirring just until the mixture begins to boil a little bit and thicken. Mix in vanilla, nutmeg, and cinnamon. Pour into an airtight container and refrigerate for an hour before serving.